Coal price weakness has decimated the value of European gas-fired power plants over the last five years. But falling gas hub prices are quietly starting to undermine the competitive advantage of coal plants. Gas vs coal plant switching is set to be an important driver of hub price dynamics and the recovery in gas plant value on the Continent. Five years of coal price weakness has decimated the value of European gas-fired power plants. Spark spreads in Continental power markets have fallen into deeply negative territory as coal plants have dominated the setting of marginal power prices. Gas plant load factors and margins have plummeted as CCGTs have been relegated to a peaking role. Against this backdrop, market sentiment on the value of gas plants in Europe is understandably very poor. Substantial volumes of existing gas-fired capacity is being closed or mothballed. Investment in new CCGTs has all but disappeared. Forward market pricing and the actions of asset owners point towards a consensus view of ongoing weakness in gas-fired generation margins. However a more structural weakening in gas hub prices is quietly starting to undermine the competitive advantage of coal plants. This has not yet had much impact on realised gas plant margins on the Continent. But as gas prices fall, gas plant optionality is becoming less ‘out of the money’. This has a positive impact on expected margin capture and risk adjusted asset values. In a recent article we showed newer CCGTs starting to displace coal plant in the UK merit order as gas prices fall. Gas vs coal switching happens in the UK before it does on the Continent as a result of the carbon price floor and dominance of gas plant in the UK generation mix. The picture in Germany is a different story, as shown in Chart 1. Chart 1 shows that gas hub prices need to fall from current levels around 7 $/mmbtu to below 5 $/mmbtu in order to bring CCGTs back into merit in the German power market (assuming a constant coal price level). As gas prices fall, the competitiveness gap between coal and gas plants is closing. But another significant hub price down leg is required before market pricing induces structural (baseload) displacement of coal plants by CCGTs. We have chosen Germany to illustrate switching dynamics because it is the core of the NW European power market. But also because it is one of the most difficult European markets for gas-fired plants. 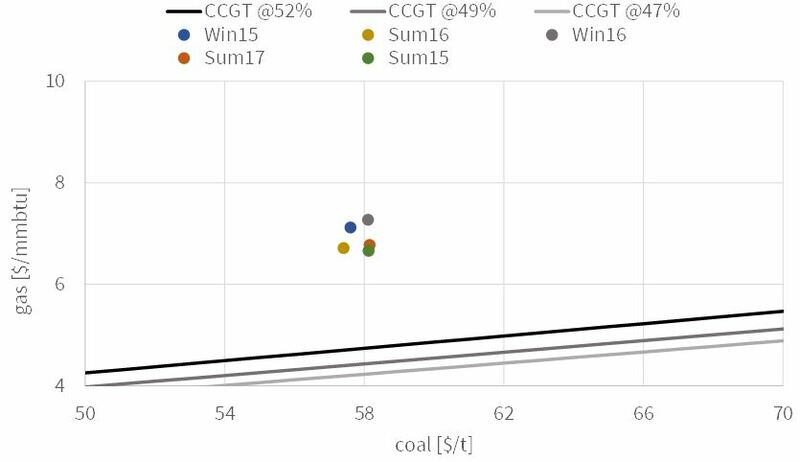 Black coal and lignite plants currently enjoy a significant variable cost advantage over CCGTs. At the same time, increasing renewable output is eroding gas plant load factors, although the development of renewable capacity is starting to face some headwinds in Germany given concerns over rising customer bills. The German market is important for its neighbours because it dominates the setting of marginal power prices in NW Europe across much of the year (particularly in summer and off-peak periods). However, the situation for gas plants in some other Continental markets is somewhat better. For example, in peak winter periods in Belgium and France, power prices separate from Germany as gas plants set marginal prices. In other words, gas plant load factors and margins in NW Europe start to increase at hub price levels well above the German baseload switching point. Russian oil-indexed gas supply contract prices (~ 7 $/mmbtu) are currently driving marginal pricing dynamics across Europe’s hubs (NBP, TTF, NCG) as shown in Chart 2. But European LNG import volumes (green supply tranche in the chart), may be close to the ‘tipping point’ where oil-index contracts are pushed off the margin, as we set out here. At the point that the European gas market can no longer absorb more LNG imports by ramping down pipeline supply contract volumes, gas vs coal plant switching becomes a key source of incremental gas demand and hub price support. This is a key factor behind the downward slope of the European gas market demand curve, shown in Chart 2. The UK provides initial switching support for hub prices given the carbon price floor and dominance of CCGTs, approximately 20 bcma in a 5.50-7.00 $/mmbtu gas price range. But if the European gas market moves into a period of more significant oversupply (e.g. 2008-09), gas displacement of coal plant on the Continent may also be required to induce demand support. We estimate 60-80bcma of incremental demand in a 4.00 to $6.00 $/mmbtu price range. 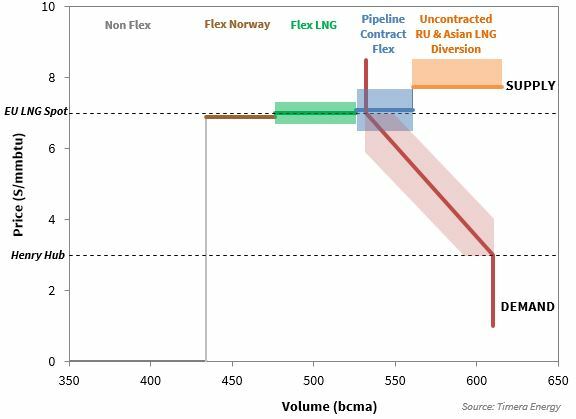 If LNG imports into the European gas market continue to rise, gas plant load factors may need to increase substantially in order to absorb surplus gas volumes. Chart 1 shows a significant gas price fall required to induce gas vs coal switching in Continental markets. While that is true for baseload displacement of coal by CCGTs, switching starts to take place at much higher gas prices when hourly price shape and price volatility is taken into account. As gas prices fall, CCGT competitiveness is improving, albeit from a very weak starting point. In other words the ‘out of the moneyness’ of CCGT optionality is falling and peak margin capture opportunities are increasing. This is particularly the case in markets where gas plants play an important role in winter peak periods (e.g. Belgium & France). Higher peak margins, increasing the right tail of asset value distributions & supporting the value suppliers place on ‘peak insurance’. Structural recovery in gas plant competitiveness, where falling gas prices cause displacement of coal plants and higher CCGT margins and load factors (e.g. if hub prices reach the tipping point as LNG imports rise). The analytical challenge for asset owners and investors is to properly quantify the impact of 1. and 2. on risk adjusted asset value and asset risk/return dynamics. The traditional Base, High & Low scenario view of analysing asset values is of limited benefit in doing this. Instead it is important to use a probabilistic plant valuation model that generates asset margin distributions and allows a robust calculation of risk adjusted asset value. The commercial challenge for owners and investors in CCGTs on the Continent is covering fixed costs over the period until asset margins recover. This is reflected in low (or zero) current asset values. Deep value discounts remain for Continental gas plants given more challenging risk/return dynamics and bearish CSS sentiment. These conditions are supported by the fact that most markets in NW Europe currently have healthy capacity margins. However over the next five years, as less flexible and higher emission thermal plants close, capacity constraints are going to start to bind across European markets. Regulators and system operators are aware of this problem and capacity payment mechanisms are being progressed to support adequate volumes of flexible capacity. Against a backdrop of increasing renewable intermittency, there will be a requirement across European power markets to maintain relatively high volumes of flexible lower load factor mid-merit and peaking capacity. Retaining existing gas-fired assets is the cheapest source of this flexible capacity, as the UK capacity market experience is showing. The current ‘graveyard’ consensus on Continental gas plant value is consistent with asset margins today. But value dynamics look very different in a world where capacity payments cover fixed costs and there is asymmetric value upside from recovering wholesale energy margins (e.g. as gas prices fall & power volatility rise). The challenge is to successfully bridge this gap with the right asset in the right market. This relies on the ability to generate a robust view of risk adjusted asset values.